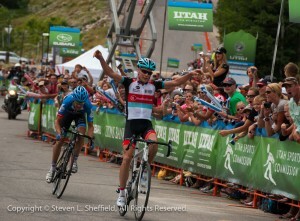 Chris Horner takes stage 5 of the 2013 Tour of Utah by outsprinting Tom Danielson. Photo: Steven Sheffield. SNOWBIRD, Utah – Wiley veterans to the last meter. Chris Horner (RadioShack Leopard Trek) and Tom Danielson (Garmin-Sharp) patiently tracked down and dispatched competitor after competitor until the final stretch where Horner surged around Danielson for the win at the Larry H. Miller Tour of Utah’s Stage Five presented by Utah Sports Commission. In the process, Horner leaped to the top of the overall standings and into the Tour of Utah yellow jersey. Danielson (USA) is tied with Horner (USA) in overall time, but Horner’s stage victory earned him the top step of the overall podium. The previous overall leader, Garmin-Sharp’s Lachlan Morton (Australia), was with the new leader heading into the final climb up Little Cottonwood Canyon but was dropped amid a series of attacks from a variety of racers and faded off the back, finishing 4:05 behind Horner. BMC Racing Team’s Yannick Eijssen (Belgium) was the last remnant of an early breakaway and rode solo up Little Cottonwood Canyon until Horner and Danielson caught him at Tanner’s Flat with about four kilometers to go. After Eijssen was dropped a little later, Horner paced behind Danielson until the decisive sprint. The new overall leaders at Horner and Danielson with UnitedHealthcare’s Lucas Euser (USA) in third, 33 seconds back. Another pair of RadioShack riders, Matthew Busche (USA) and George Bennett are fourth and fifth, just 37 seconds behind Horner. The Larry H. Miller Tour of Utah’s “Queen Stage” is traditionally the hardest day of racing with the most climbing of the race. The 2013 stage route is different that in years passed with a climb over Guardsman’s Pass – the highest climb of the race since the opening Stage One climb at Brian Head – and a descent of Big Cottonwood Canyon before climbing the familiar HC Little Cottonwood Canyon to Snowbird Ski and Summer Resort. Passing six Wasatch Front ski resorts this year, Stage Six has had a stage finish at Snowbird in each of the past five years. Horner’s win sets up what will be an epic final day of the Tour of Utah with powerhouse teams RadioShack Leopard Trek and Garmin-Sharp keeping each other in check while preventing any other teams from playing spoiler. After missing several months of racing with an injured knee, Horner said he is back and his result at the Larry H. Miller Tour or Utah is proof. Bissell Pro Cycling’s Michael Torckler was part of an early breakaway and picked up enough points to hold onto his Ski Utah King of the Mountain jersey for another day. The XO Communications sprint leader’s jersey still belongs to BMC’s Greg Van Avermaet (Belgium) and Morton, despite losing the overall lead, retains his advantage in the Subaru Best Young Rider competition. Sunday, August 11, brings Stage Six presented by Barracuda and VLCM. The 78 mile stage begins and ends in Park City and includes two Ski Utah KOM climbs, a category 2 ascent of Wolf Creek Ranch and the HC climb of the Empire Pass for a total of 7,633 feet of vertical gain. One XO Communications sprint point awaits the field in Midway before the final climb. Stage Six presented by the Barracuda and VLCM will begin at 12:15 p.m. MT, and finish at approximately 3:45 p.m. MT.